Duffy was an impulse buy. But the best impulse buy ever. He came into the household in 1999. He learned about balls and Flyball from his big brother, Willie. He found out that balls and tugs were the greatest things on earth. And if he got to play Flyball, he could have both. He was in heaven once he started racing. He earned his FD in June of 2000 at 1.5 years old. He was not an easy dog to run because he liked to compete with his own teammates as well as the other teams. He became an excellent anchor dog simply because he wanted to win no matter what so that he could trash talk to his competitor. He, also, would run for anyone with a tug or cheese so that Lauralee could run the other dogs in the household. 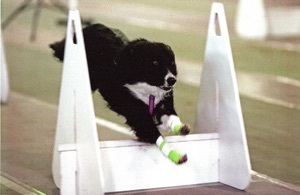 Because he loved Flyball, anyone who ran him had a blast. While he was racing, he was always in the top 50 ranking each year. He was the first dog on No Speed Limit and the 2nd on Region 15 to earn his Flyball Grand Champion 80K. 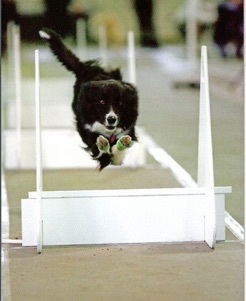 When he retired from racing, he was NAFA’s 27th Top Pointed Dog and 11th Top Pointed Border Collie.